THIS IS A GREAT COTTAGE FOR RENTAL. CLOSE TO ALL AMENITIES. CHECK IT OUT. IF YOU ARE ONE, TWO OR 3 FAMILIES WANTING TO SHARE YOUR VACATION TOGETHER THIS IS THE COTTAGE SETTING FOR YOU.2 Bedroom cottage with bunkie situated on the Muskoka River. 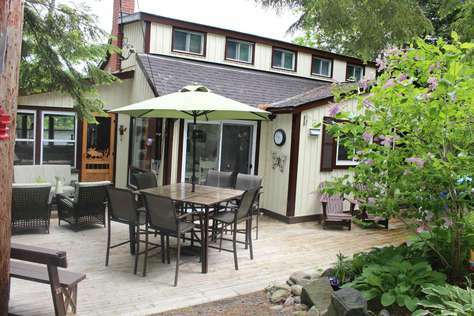 Cottage features large wraparound deck, enclosed hot tub, trampoline, large rink for ball hockey in the summer and ice hockey in the winter, badminton area, camp fire pit. This cottage has many unique features. Enjoy the bar area at the back of the cottage while the kids play on the toys on enjoy a game of pool. The bunkie has lots of room with 2 double bunk beds with doubles on the bottom and singles on the top. Share this cottage with another family. 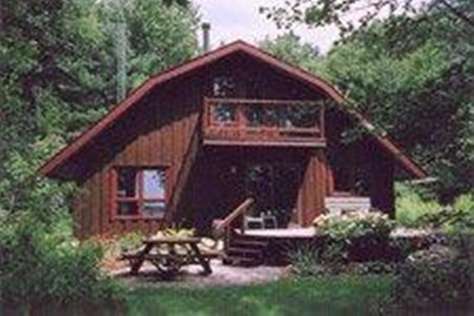 The cottage is conveniently located 15 minutes east of Bracebridge, close to all amenities. There is no marina on this part of the Muskoka river but there is approx 10 kms of waterway to explore and a public boat launch nearby. Steps from the cottage is the river with dock to sun and relax. Soft bottom, deep off dock. Southern exposure. Cottage and bunkie can sleep 12 people. 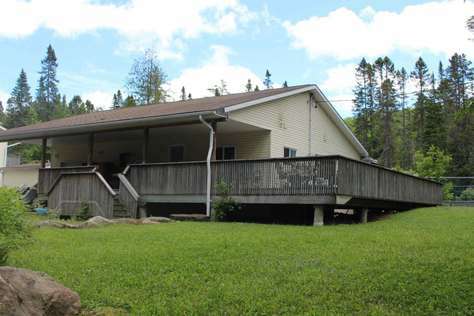 Also inquire regarding another cottage and bunkie on the same property for rent. 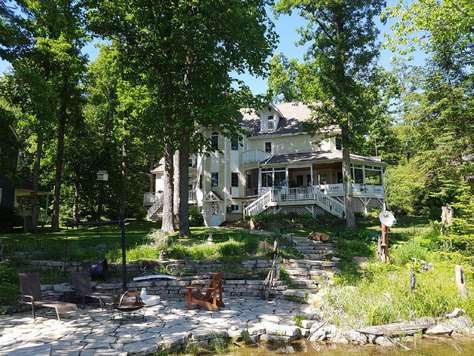 Share the dock and backyard with the owners of these 3 cottages. NOW READY THE 2ND COTTAGE, BOOK BOTH COTTAGES FOR $2200.00 FOR THE WEEK........OR EACH COTTAGE INDIVIDUALLY AT $1100.00 FOR THE WEEK! Very child friendly property. Waterfront offers a hard packed sand beach.The nearby Mill Stream boat launch allows easy access to Lake Muskoka, Rosseau & Joseph.14' aluminum boat along side the T-shaped dock is included. For more adventure some people jump off the dock into the water can be your refreshing dip, or sit and relax in the muskoka chairs either on the dock or the patio. Beautiful floor to ceiling granite fireplace enhances the bright, cheery living room. Enjoy the view from the sunroom or the Muskoka room. BBQ, DW, DRYER, DVD, Fireplace, Fridge, MW,Oven/Stove, Stereo,Telephone, TV, VCR, Washer. There is now Wifi at the cottage. Property is one acre, level, private, natural maple, oak, pine and hemlock forest with appropiate lawn area, waterfront 120 feet shallow depth suitable for young children to wade, firepit close to waterfront and firewood available. Modern 1.5 story cottage, 1500 square feet with tile/hardwood floors. Enjoy a south view across Lake Muskoka from two decks. Near Bracebridge, Santa's Village Amusement Park, many hiking/biking trails, golf courses, live theatre, interesting shops, numerous Muskoka resident artists, steamship lake tours, close to public beach and marina, boat rental, endless list of activities and places to visit. Paradise in Rosseau. Situated on Shadow River just West from Lake Rosseàu is this gorgeous and breath taking property with panoramic views from all 6 bedrooms and 3 balconies. Majority of room face lake Rosseau. 2.2 acŕes of blissful perennial gardens that surround the lot both front and back. 4 floating docks south facing with sunshine all day long. The river is quiet and serene only 3 minutes away from Lake Rosseau proper for all types of recreational water sports and boating. There is water access to Lake Muskoka and Lake Joseph. Lots of Kayaking and canoeing up Shadow River, a very tranquil river and while boating you can tube or water ski and spend many hours sight seeing the many Celebrity owned estates and many kilometers of unspoiled shoreline. Short cruises to Windemere and Cleveland House for a variety of meals and entertainment!